Only a month a go I visited the Harley Gallery to see Andrew Logan’s current solo show. I was one of about 15 people who had also gone to hear Andrew speak about his work, inspiration etc. The feeling was intimate and confidential; it was a fantastic night. He is such a gentle, engaging and entertaining person. I had already met him at New Designers in 2006 and had also visited his personal Museum at Berriew in Wales. This talk was a brilliant insight into the inspiration, personal drive, self-belief and general sunny outlook of an artist that I really find inspirational. I love mavericks and feel that I am one myself. He talked us round the exhibition and pointed out personal items, some from his childhood, some collected on his travels which had either been a starting point for the piece or were key to its making and personal resonance. Of course knowing that all the toy farm animals were the ones he played with as a child was special for me. My father is a farmer and so my brother and I played farms a lot. He had to be nice to me when he wanted to borrow my bull to mate with his cows! The starting point for this wonderful fantasy farmland was the miniature gold coronation coach which Andrew had bought as a child. It seems quite sensible then to cover them all with gold and bronze leaf! Also incorporated are his recorder and five tulips (“Simply because they seem such hopeful flowers”) resulting in a wonderful fun and fantasy narrative. Surreal things have a magnetic pull for me and so Buddha’s Sandal is the piece that I’d probably buy. It needs no explanation. Also the hubcap flowers with Brian Eno ambient music floating from them are really quite perfect. 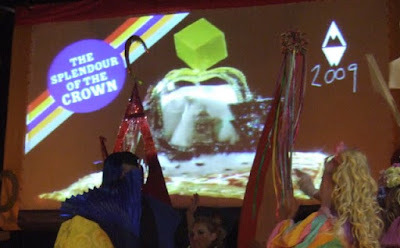 I’d watched video footage of previous Alternative Miss World Competitions but it wasn’t until Andrew’s talk that I discovered that, after a five year gap, he was hosting another of these, “Surreal Art Events for All Round Family Entertainment” on 2nd May. So we threw together our costumes on the theme of Elements and whizzed down to The Roundhouse to test out the “Family Friendliness” of it….. So, bearing in mind that my children have already experienced quite a few alternative events, performance art, street theatre and unusual characters, how did it go? It was fantastic, even better than I’d imagined, worth every penny and perfectly British. We are known for our eccentricity! I’d phoned Andrew the day before, just to double check that we should dress up. “Oh yes, definitely. You’d feel the odd one out if you didn’t”, was his reply. However probably more than half the audience had gone “straight”; their loss not mine! It was a great leveller. Yes there were plenty of famous people there (more at Madame Arcati and Frances Lynn's blogs). And there were artists, transvestites, burlesque and erotica specialists. All ages young and old (however we did stand out as the token family!) But we were drawn to others who had dressed up and the conversations always started around costumes. Homemade, was the order of the day again fun was more important than having a professional finish to your costume. Miss Flotsam enjoyed every minute of it. Little Miss Sustainable's daywear, swimwear and eveningwear costumes were outstanding for their craftmanship. There were 20 entrants and often these were not limited to a single person. Miss Hokusai had two assistants, very necessary for her day wear costume as she was wheeled onstage on a hospital bed (her swim wear costume of a giant paper origami wave dress had its own wheels incorporated so her assistants were less necessary). Miss Bubbles of Hope came on as a bubble person riding a pink bubble horse, and later as a champagne glass and bubbles, and found her interview difficult as she had no head or even mouth. Miss Translatin was comprised of three bodies impersonating cocoa pods dancing on stage but when it came to dancing, Miss Elementary My Dear won hands down. For her evening wear entry her team of at least twenty were either playing in their own Morris dancing band or taking part in the Morris dancing itself. Their dodgy outfits and make up took me straight back to my childhood and again very definitely back to Britain. All you need is a charity shop, some lavender perfume, face powder a bit of lipstick and headscarf. No one will notice that you are a bearded man dancing on stage amongst transvestites, bubble people, and young girls dressed as Victorian Mayday dancing girls. Miss Fancy Chance takes the crown. Video interview with Andrew Logan at the Guardian Newspaper website. I love Buddha's sandal, but for me it's the little farm. Rather chuffed as i have had two poems accepted for the third issue of Ouroboros Review, which will be out in July. Yes, I was there too and it was definitely a fantastic night. The photos look great, and I personally loved Little Miss Sustainability's swimwear aswell! It was great to be the only family there, wasn't it? Hi Kirsty, Miss Flotsam (Helen) and I would like to thank you for your very kind words and for the photos you sent us. Your family are brilliantly made up for the event and you all look so happy! That was a very nice write-up of the event. Andrew Logan really is a lovely man, and the talk you went to with him sounds great. The party in his house on Sunday night will live in my memory for a very long time, as will the AMW show. 3 years until the next one seems too long! Cheers and thanks again, Tom. That looks like such a lot of fun!